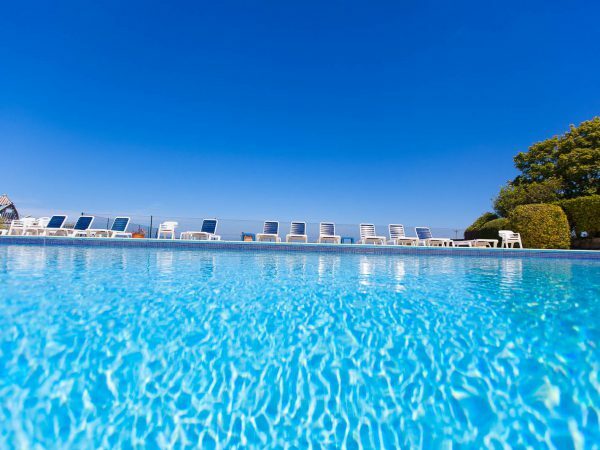 Lying on the beach, swimming in the sea, enjoying long lazy lunches… We all know how to unwind on holiday. 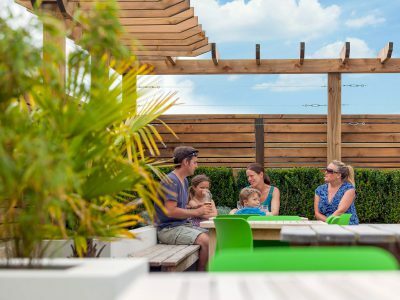 However there’s an extra feeling of relaxation that comes from knowing that everything’s taken care of – and that’s what we aim to give our visitors. Too chilled out to cook? Wander over to the bar and restaurant. Fancy a trip into town? Catch our very own bus. 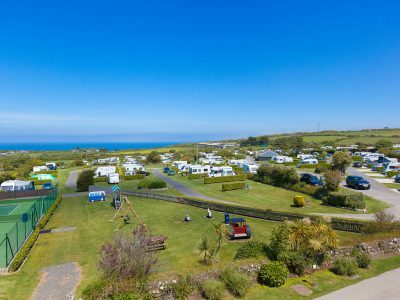 From a place to wash your sandy dog to a daily batch of freshly-baked bread or breakfast croissants, we hope we’ve thought of everything to make your Cornish camping holiday as easy and relaxing as you’d wish for. 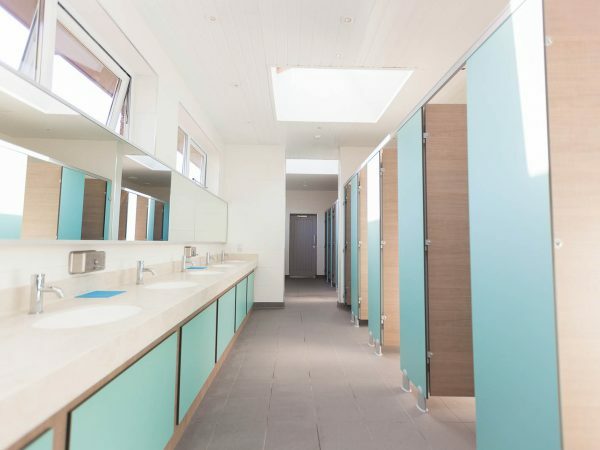 The standard of the amenity blocks in campsites is so important – so we’re delighted to tell you that all three of our shower and toilet blocks have been awarded an “Excellent” rating by the English Tourist Board. 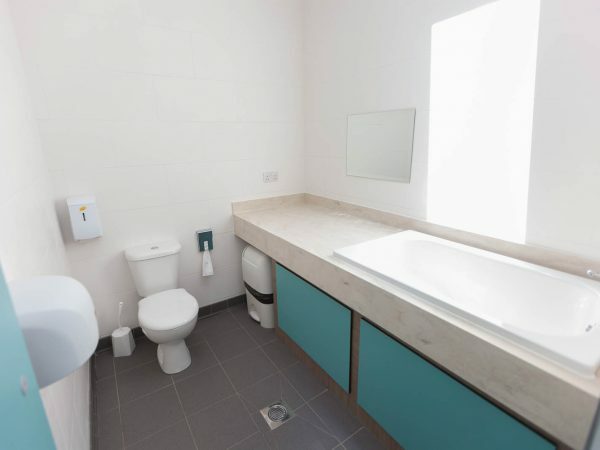 In each block, you can step out of the shower onto underfloor heating, and enjoy free hairdryers or plug in to electric sockets and shaver points (with generously sized and well-lit mirrors). 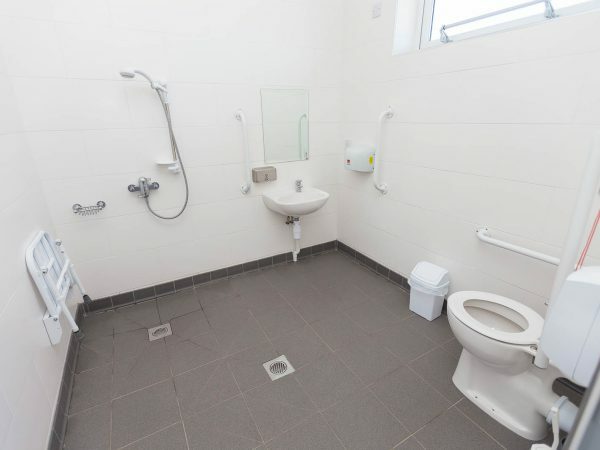 There are also family shower rooms with toilet, sink, shower and bench as well as comfortable disabled suites. This lovely granite building was once the farm’s milking parlour. 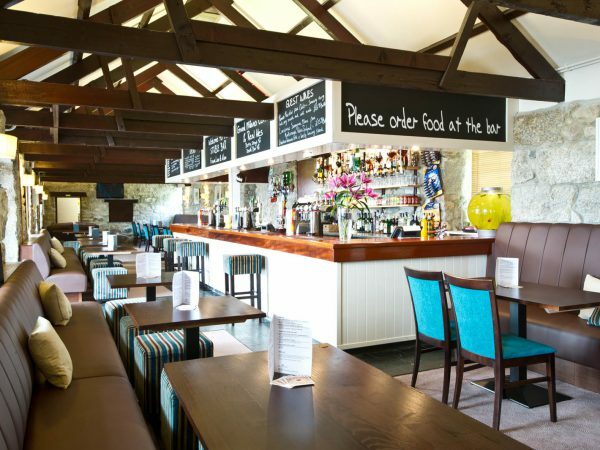 Now our welcoming restaurant, it has a snug bar area and a lovely, light conservatory. Open from 5-nights a week from Easter onwards, to all-day, 7-days a week in the peak weeks, we serve fabulous Cornish produce, with fresh fish and local meats starring on the menu. Our pizza oven is a great favourite, and we’ve become renowned for our succulent homemade burgers. You can even grab a take-away if you’d prefer to enjoy your food back at your pitch. Or, simply wander over in the evening for a glass of Cornish beer or wine. A good campsite shop should sell the right combination of essential items and holiday luxuries. If you’re looking for freshly baked baguettes for breakfast or batteries for your torch, you can find them here. 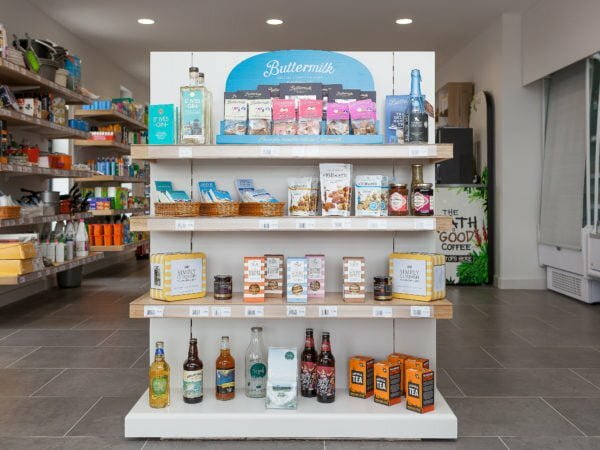 Treat yourself to local beers, biscuits, and even Cornish-made chocolate. For information or assistance, please call into Reception. 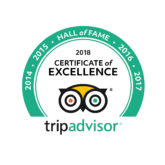 Many of the team have worked here for years, and can give plenty of advice about camping and Cornwall! We’re a family ourselves, and as our kids have grown, Polmanter has developed with them! From camping with young children, we’ve learned that most little ones don’t like showers – so we’ve designed special baths for your babies. The baths are at waist height to make it easier to bathe your splashing baby or toddler. There are two baby bathrooms in Levant, our most recent block. For older children, all three blocks have special family shower rooms with toilet, sink, shower and bench. Our spa and beauty treatment rooms, new for 2017 – Now open! Offering relaxing body and nail treatments and Decleor facials, we hope you will enjoy the chance of some peace and pampering during your holiday. We’ve also become a dog-owning family, so know how important it is that your holidaying pet is happy! 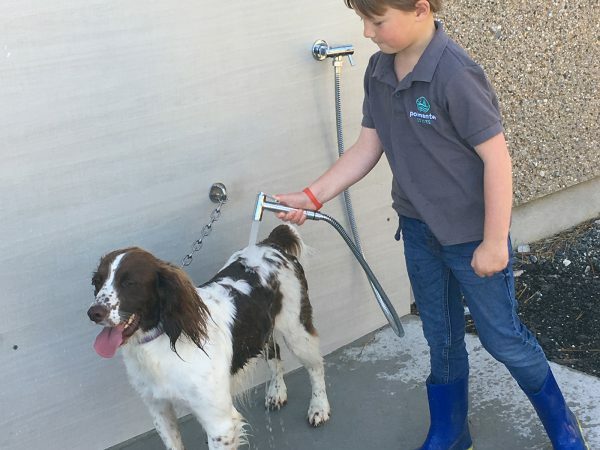 We’ve installed a shower to clean them down after a day out; and if your dog doesn’t like being left behind while you have your shower, there are tethering points and water outside the amenity blocks. Please keep your dog on a lead on the pitches; however there is a dedicated exercise field for your pooch to have a good old run. Our team at Reception can tell you about some great local walks, and advise you on dog-friendly beaches. 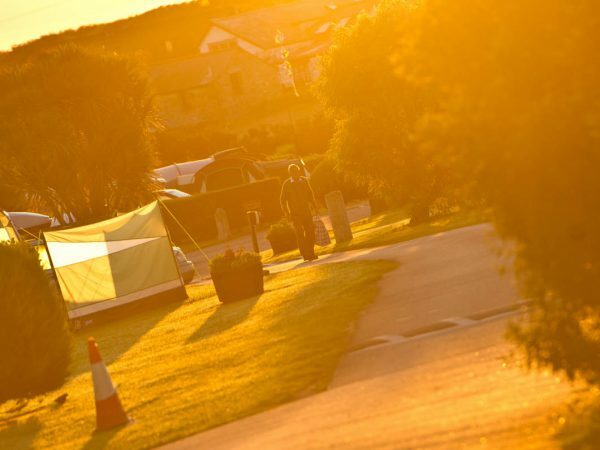 Parking in St Ives isn’t always easy – and neither is packing up your motorhome every time you want to leave the site. To help our visitors enjoy our lovely local town, Polmanter has a dedicated bus which runs all day every day during the busiest months. 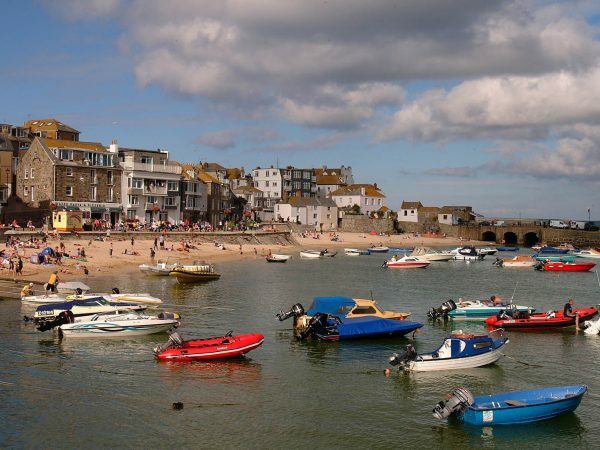 Simply pick up the bus from the campsite, and you’ll be in the centre of St Ives within ten hassle-free minutes. There are timetables at Reception. Now the nitty-gritty information… It’s easier to relax when your camping daily needs are simple to take care of. 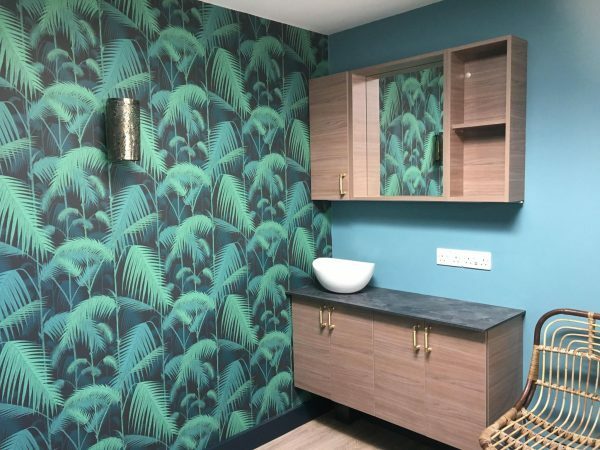 There are washing up rooms in all three amenity blocks, and a freezer room in Levant block. There are Elsan disposal points at the three blocks too. The large laundry room is open every day and evening. 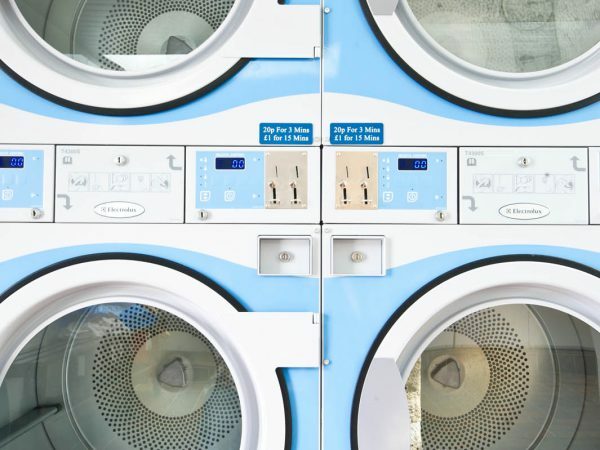 It has industrial-quality washing machines and dryers, which are all coin operated as well as irons and ironing boards. At Polmanter we’re always working towards making our campsite welcoming and accessible for all our guests. Take a look at our accessibility page to learn about how we can help with your stay. Take a look at our “Frequently Asked Questions‘ page for more information about the site, and contact us if there’s anything we haven’t covered. We had 2 weeks camping at Polmanter during May half term. We absolutely loved it. The park is so well maintained and like how the plots are made private with hedges. The pub and food and drink was superb as usual. Really like the new outdoor patio area and the welcome bbq. 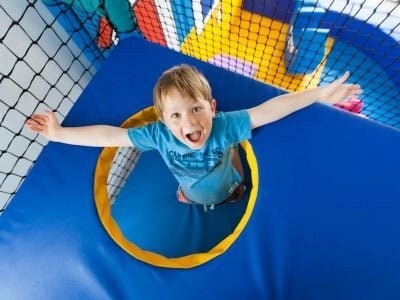 The new addition of the soft play is a fantastic idea.